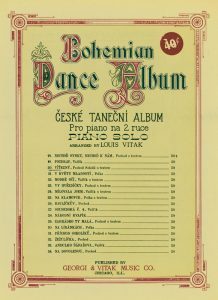 We carry dozens of sheet music selections from the Vitak-Elsnic collection for the pianist, most of which are of songs also published for small band and orchestra or for accordion. Much of the music that we sell for small bands and accordion is also available for piano solo. Our online selection is dwarfed by the amount of music we have in archives. Many of our individual piano solos in archives also have Czech or English-language vocals.